CLEMSON, SC – Clemson women’s basketball assistant coach Itoro Coleman will compete with the Nigerian national team at the upcoming FIBA World Championships in Sao Paulo, Brazil from Sept. 12-23. The Nigerians are grouped with Russia, China and the United States for the preliminary round and will open against the Russians on Sept. 12. Nigeria will then take on the USA in a televised contest on Sept. 13. NBATV will air the game live at 6:45 pm Eastern Time and Fox Sports Net will rebroadcast it at midnight. The Nigerians’ final preliminary round match-up against China will be on Sept. 14. The preliminary second round will be played from Sept. 16-18 and the quarterfinals will be held on Sept. 20. The semifinals will take place over Sept. 21-22, with the finals being played on Sept. 23. The 2006 FIBA World Championships will not be Coleman’s first taste of international experience. The former Clemson star also played with the Nigerian team in the 2004 Summer Olympics in Athens, Greece. She averaged 9.0 points per game over five preliminary contests, highlighted by a 12-point, six-rebound performance in the opening round versus Australia. Coleman is entering her fifth season as an assistant coach of the Lady Tigers after a stellar playing career at Clemson. As a coach, she helped the Lady Tigers to a 17-12 record and a WNIT appearance in 2003-04, her second season on the sidelines. 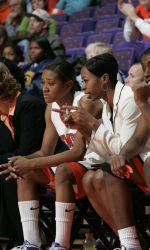 As an assistant in 2002-03, she guided Chrissy Floyd to first-team All-ACC honors and helped Lakeia Stokes earn the same honor for the 2003-04 season. As a player, Coleman (formerly Umoh) led the Lady Tigers to a pair of ACC Tournament championships. Clemson won the title in her freshman year, 1995-96, and again in her season season, 1998-99. Coleman was named the tournament’s Most Valuable Player as a senior, in addition to a first-team All-ACC selection. She was also an honorable mention AP All-American in 1999 and was selected to the ACC’s 50-Year Anniversary team in 2002.